Screaming Females é uma banda de Nova Jérsia nos EUA. Formaram-se em 2005 e editaram vários discos de estúdio. Começaram com BABY TEETH em 2006 que assinalou a sua estreia. O disco demarca-se pela qualidade de um indie rock puro aliado à voz de Marissa Paternoster. O disco que se seguiu, WHAT IF SOMEONE IS WATCHING THEIR T.V? editado em 2007 segue a mesma linha do anterior, com um trabalho mais vincadamente punk e garage rock. As músicas são infusas de viciantes linhas de guitarra (tocadas por Marissa Paternoster) e de baixo (tocado por Michael Abbate). A bateria tocada por Jarrett Dougherty dá ainda mais energia e preenche as músicas com melodias contagiantes. Depois destes dois discos corpulentos seguiu-se POWER MOVE em 2009 com uma direcção de indie rock tão contagiante quanto os seus predecessores. É um disco que exala energia, criatividade e diversão que se sente por quem toca e que quem ouve certamente também sentirá. Logo no ano seguinte foi editado CASTLE TALK. Um disco mais virado para o punk rock, mas que carrega o estandarte sonoro típico da banda, um indie rock feroz, enérgico e divertido. 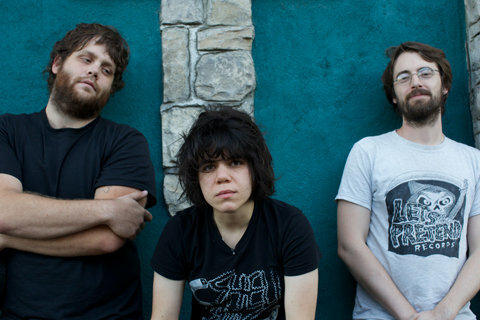 Screaming Females is a band from New Jersey, USA. They formed in 2005 and released several records. The first one was BABY TEETH released in 2006 and it was their debut. The record sets itself apart by the quality of a pure kind of indie rock allied to the vocals by Marissa Paternoster. The next record released in 2007 and titled WHAT IF SOMEONE IS WATCHING THEIR TV? follows the same kind of sound of its predecessor but with a garage/punk edge. The songs are infused by catchy guitar (played by Marissa Paternoster) and bass lines (played by Michael Abbate). The drums played by Jarrett Dougherty give out even more energy to the songs. After these strong two albums, the band released POWER MOVE in 2009 with a indie rock vibe as contagious as the other albums. It’s a record that exhales energy, creativity, and essentially fun. It feels like it was fun to play the songs and the listener will surely feel that way as well. The following year, they released CASTLE TALK. A record that has some punk rock influence but still carries the trademark sound of the band, a ferocious, energetic and fun kind of indie rock. In 2012, UGLY was released, a fresh record of indie rock with some garage and punk leanings. It has 14 songs of catchy melodies and some true indie rock hymns. ROSE MOUNTAIN was released in 2015 and it has some subtle grunge influences.